Every year people around the globe, those who are a part of the golf world or those who barely pay attention to it the rest of the year, turn their televisions to CBS during the first full week of April so that they can welcome a new spring – even if it doesn’t turn out to be sunny and warm in Augusta, Ga. that year. Beautiful sunshine or cold wind, the master gardeners who paint the colors of Augusta National Golf Club present all of us who are so eager to burst out of another winter with the greenest grass, the most majestic trees and thousands of flower blooms – if not always azaleas. The Masters is much more than a golf tournament, although it is generally considered, along with The Open Championship in Great Britain, to be one of the two most significant in the world. The Masters is the start of the sports season and the end of overcoats, it is the promise of new beginnings and of thrilling finishes. The Masters is acres of brightly dressed people who are just so happy to be here that there are lines at pay phones (still no unwanted ringing cell phones allowed). And the people making the calls are not checking their e-mails – they are telling their golfing buddies back home which hole they are calling from at the Masters and how beautiful it is. There are no cynics in Augusta during Masters Week, a proper noun here. The few thousand non-fans who live here the other 51 weeks of the year rented their house beginning last Saturday to fans eager to realize their bucket list dream of being in Augusta this week. And the party doesn’t stop. All over Augusta and a score of smaller towns around it – most notably in Aiken, S.C., an elegant equestrian and golf resort 20 miles to the east across the Savannah River – the sidewalks are full of laughing people, spilling in and out of restaurants, backyards are packed with dear friends who finally got that invitation to go to the tournament with a local, and very dear, friend, and golf courses are full. Every bar has the tournament on their big screens and every customer is a fan who can rattle off the names of their favorites and who have a lifetime of Masters Week memories to share. The rare voice that whines about being overcrowded or having their cocktail service slowed a bit are ignored. “Just order two and there’ll be no wait next time” is the advice they’ll likely get from someone whose dream is coming true. This is springtime in Augusta and Masters Week is magic, even if it rains all week long. Prognosticating has gotten more difficult because there’s no doubt we have entered into a golden age of worldwide golfing greatness. Two generations ago there were probably half-a-dozen truly great players and a score with a realistic chance of winning the tournament. Thirty years ago, there were a dozen great golfers around the world and about twice that many who were picked in the first round of traditional Augusta “Calcutta” parties, where very conservative people put their money behind their pick. In the last five years great players from 20 years ago are still around to challenge a wave of what appears to already be some of the finest players ever to walk these fairways. Golf fans are giddy with expectations of 10 or 12 of these phenomenal players bunching up on the back nine on Sunday and producing a Masters for the ages. It wasn’t a dozen, but five of the world’s best shot it out last year when U.S. Team hero Patrick Reed wrestled the Green Jacket, the symbol of a Masters champion, away from the riotously popular Rickie Fowler, the next great Spanish phenomenon Jon Rahm, multiple major championship winners Jordan Spieth and Rory McIlroy, and a pack of other legitimate contenders. The roars of the galleries as birdie putts dropped shocked people with their ferocity and the groans from missed par putts rumbled over the hills for half a mile. The 2018 Masters Tournament lived up to the legends of the first 81 played here. Have you got your Calcutta wagers decided yet and, most importantly, for what days have you got your badges secured? All the strategy and tactics were settled and practiced as much as they would be – the Par 3 Contest on the afternoon before the high anxiety opening round is a welcome chance for everyone to relax and have fun. Once again at the Masters it came down to Tom Watson and Jack Nicklaus, playing together with another Hall of Fame member, Gary Player – only this was on Wednesday on the Par 3 course, not out on the big course during the rest of the week where it counts. On the 9th hole Nicklaus’ grandson and caddie, Gary, 15, hit a tee shot for Jack and rolled in a hole-in-one. A few minutes later Watson stroked in a birdie putt that won the tournament for him with a total score of 20, seven-under par, one stroke off the course record for the 59th playing of the pre-tournament diversion. At 68, he also became the oldest player to win it, 36 years after winning his first Par-3 in 1982 to go with the two wins he also has in the major tournament (1977 & 1981). So many times it was Watson and Nicklaus at the end. In the 1977 Masters, Watson defeated Nicklaus by two shots and the margin was two strokes again in 1981 over second place finishers Nicklaus and Johnny Miller. He also beat Nicklaus by a stroke at the 1977 (British) Open Championship, and by two strokes at the 1982 U.S. Open. Watson never finished second to Nicklaus. In keeping with the spirit of fun at the Par 3, there were tears of joy streaming down Jack Nicklaus’ cheeks and pure happiness that made his voice crack. “In all my wonderful times here, watching my grandson make a hole-in -one is the best moment I’ve ever had at Augusta National,” said the only man in the world with six green jackets (or five either for that matter) after he hugged everybody in sight. Just as the celebration began with the launching of the first strokes of the 2018 Masters Tournament, there was a palpable reminder of past greatness and the haunting presence by omission of the greatest Master of all – Arnold Palmer. Gary Player, then 82, and Jack Nicklaus, 78, gathered with another “new tradition” in the person of new Tournament and Augusta National Chairman, Fred Ridley. The chairman introduced the legendary golfers, owners of nine green jackets between them, and watched them strike the ceremonial opening shots of the tournament. It was the second year that Nicklaus and Player had performed the honors following the passing of four-time winner Arnold Palmer in September 2016. Palmer hit the opening shot from 2007, ending four years without the tradition, until 2016. Nicklaus joined Palmer in 2010 and Player reunited “the Big Three” in 2012. Always the competitors, Nicklaus, while happy to have struck a drive in the middle of the fairway, took it personally that Player’s drive was longer. “You’ve got to be kidding me,” Nicklaus said, laughing at being bested in driving distance by Player, an outcome that would not have occurred during their playing careers. “Life is full of surprises,” Player said. “That’s one I didn’t know about,” Nicklaus added. As exciting as the opening round of a new Masters Tournament always is – it’s like Christmas Day has finally dawned – the leaderboards and the galleries weren’t keeping pace with the excitement that morning. Much of the day slumbered by as few players challenged the course or the field, until one of the heavily favored players, Jordan Spieth, lit up the back nine for the galleries, hungry for something to cheer about. Spieth, the 2015 champion, birdied five consecutive holes on the back nine to post a round of 66 (−6) and take the first round lead for the third time in four years. The roars got louder and louder from the lower reaches of the back nine where the landscape amplifies the sudden loud cheers as Spieth made birdies at Nos. 13, 14, 15, 16 and 17. The highly popular Spieth, who was second in 2013 and 2016, also made birdies on Nos. 2 and 3 and a dramatic eagle on No. 8. But bogeys at Nos. 5, 7 and a disappointing finishing bogey at 18 kept Spieth from sprinting far ahead. Playing a day after dislocating an ankle during the Par-3 Contest, Tony Finau finished his six-birdie and two-bogey Thursday round two shots back, along with the popular Georgia Tech star Matt Kuchar, who shot a under 31 on the back nine, at 68. Next came a wave of seven players, four of them real contenders, who finished their first round at three-under 69 and three behind Spieth. They were 2016 Open Champion Henrik Stenson of Sweden, Charley Hoffman who has gotten off to several good starts at Augusta, two-time collegiate team national champion from none other than Augusta State University, Patrick Reed, plus the only man in the field playing to accomplish golf’s highest status, winner of The Grand Slam, Rory McIlroy of Northern Ireland. Also, at 69 were Canadian Adam Hadwin, Li Hao-Tong of China and Spaniard Rafa Cabrera Bello. Lurking four strokes back at -2 (70) were three-time Masters Champion Phil Mickelson, rising star Rickie Fowler, Former Masters and Open Champion Zach Johnson plus Australian Marc Leishman and Austrian Bernd Weisberger. Hoping to start yet another comeback, four-time Masters Champion Tiger Woods, saved a +1 (73) that he called “just fine,” with two late birdies. Defending champion Sergio Garcia, who had a life-changing year (which included getting married) since his sudden death 2017 Masters victory over current World No. 1 Justin Rose, assured he would not be the fourth to defend his title. Standing at -2 for the day when he went for the green in two at the dramatic par-5 No. 15, Sergio watched his ball land on the green and then back up off the putting surface and into the pond. He then repeated that exact outcome four more times. That’s five strokes and five penalty strokes. Even with a one-putt the emotional Spaniard carded a 13, the highest single-hole score in the history of the Masters. Garcia did stay around to present the green jacket to Patrick Reed on Sunday. Augusta State University’s star player began to look like Augusta’s star player on Friday at the 2018 Masters Tournament when he fashioned a six-under par 66 with three runs of three straight birdies: Nos. 1, 2 & 3, 7, 8 & 9 and 13, 14 & 15. Ironically, Reed followed each birdie streak with a bogey at Nos. 4, 10 and 16. All involved agreed that Friday was a much harder day to score when the wind came up, blowing balls off line and hardening the greens. It was the kind of day when a prize fighter like Reed had an advantage over most others. His -9 score of 135 put him two strokes in front of Marc Leishman’s 67 in which he also made birdies at Nos. 1, 2 & 3 and bracketed a bogey at No. 14 with a birdie at No. 13 and an eagle at No. 15. Both Leishman and Reed must have been listening for noise from the major champions following them (with a total of eight major wins). Henrik Stenson finished the day four strokes behind Reed after a five-birdie, three bogey (70); another stroke back were two of the sport’s top stars, Jordan Spieth after a 74 and Rory McIlroy with a 71. Both of the Thursday second-place finishers dropped back: Tony Finau with a 74 to land seven strokes back of Reed and Matt Kuchar after a 75, who was now eight strokes behind. Jon Rahm came out firing with an eagle at the par-5 No. 2 but finished the front nine at even par before dropping four birdie putts on the back nine and carding a 68 to still trail Reed by eight. Sergio Garcia, 39, followed his first round 81 with a 78 and missed the cut line of 5-over, 149 by 10 strokes. He beat just two other invitees, both amateurs, Matt Parziale and Harry Ellis, and joined 10 other former champions who failed to receive invitations to the weekend rounds, including Jose Maria Olazabal, Charl Schwartzel and Danny Willett. Twenty-one other players missed the cut, including recent Tour winners Patton Kizzire and Gary Woodland. Doug Ghim, who was invited to play in the 2018 Masters Tournament as the runner-up in the 2017 U.S. Amateur, assured himself the coveted Low Amateur prize when he became the only amateur that made the cut. Playing for the University of Texas, Ghim became the world top-ranked amateur golfer in May 2018 and won the 2018 Ben Hogan Award as the best male college golfer. He turned professional prior to the 2018 Travelers Championship. Apart from the ruckus caused in front of him by his arch-golfing-nemesis Rory McIlroy, Patrick Reed may have taken command of the 2018 Masters Tournament with a third-round 5-under 67 that included four birdies, two eagles and a three-shot lead heading into the final round. Reed was even on his round before three straight birdies on holes 8, 9 and 10. At the par-5 13th, he hit his approach to 14 feet and made the putt for an eagle. Then on the 15th he chipped in from just off the green for another eagle. The green at No. 15 looks for all the world like a stage and Reed’s performance was that of a premier actor in the glare of the spotlights, and he brought down the house. McIlroy began the round five shots behind but got all that back with three-birdies and an eagle for a front nine 31, before Reed began his fireworks. McIlroy needs just a Masters victory to achieve the ultimate major championship Grand Slam and everybody in the galleries knew it – and most of them were rooting for it. McIlroy made three birdies in a four-hole stretch (Nos. 3, 4 & 6) then chipped in for eagle at the par-5 8th to get into a share of the lead. Falling as much as five shots behind Reed on the second nine, McIlroy rebounded with birdies on the 15th and 18th to post a bogey-free round of 65 and cut Reed’s advantage down to three. The weather was more cooperative on Saturday, with a light rain falling intermittently in the morning, until a cloud-burst hit McIlroy just as he was swinging for the green on the par-5 13th on his second shot. He admitted to losing focus on the shot and jerked it over the creek and into the prettiest thicket of pink azaleas you’ve ever seen. He didn’t think he’d find it but when he did, he also found a way to take a stance and a crevice to punch it back to the fairway – saving par. He got another lucky break on No. 8 when his thinly-hit chip raced across the green headed for bogey or worse before it hit the pin dead on and dropped for an eagle. “Some days it’s with you, and some days it’s against you,” McIlroy said. “Today it was with me. Hopefully I don’t need to rely too much on luck tomorrow.” That would prove prophetic. Rickie Fowler and Jon Rahm both shot bogey-free rounds of 65 (−7) and were five and six shots behind, respectively. It was the first time in Masters history that three players shot as low as 65 in the same round. Fowler started with an eagle on the par-5 No. 2 and followed it with five birdies and not a bogey on the card. Rahm accomplished the same combination, but on different holes: no bogeys, five birdies and his eagle was on No. 8. Henrik Stenson repeated his 2nd round 2-under 70 on Saturday and would start Sunday behind by seven strokes. The always steady Stenson carded 14 pars on Saturday but hurt himself with a bogey on a critical early birdie hole, the eminently reachable par-5 No. 2. Marc Leishman began the day in the final pairing, two shots out of the lead, but failed to make a birdie in a one-over round of 73 that put eight strokes between him and the streaking Reed. Jordan Spieth hurt his own cause with a +1 front nine 37 but came through on the “must birdie” par-5s, Nos. 13 and 15, to save a -1 score of 71 that left him a daunting nine strokes back. But everyone in the gallery knew that Spieth is a miracle maker and he still had a lot of true believers outside the ropes. With Friday’s wind-slick greens softened by the light morning rain, the scoring average was 71.26, the lowest third round average since 1986. Patrick Reed kept his head on Sunday to win his first major championship at the 2018 Masters – while all around him others were losing theirs or making what would have been storybook charges had they not run out of holes. Reed’s one-under round of 71 was enough to hold off charges from Rickie Fowler and Jordan Spieth. He began the day three shots ahead of Rory McIlroy but bogeyed the 1st and failed to make birdie on the par-5 2nd, reducing his lead to just one when McIlroy made birdie at No. 2. If anyone thought that made Reed feel the heat, they hadn’t watched Reed play before – adversity makes him play better. Paired together in the final group that promised fame to the victor, McIlroy had a four-foot eagle putt on No. 2 that would have tied Reed, but it failed to hit the hole. Picking up two strokes on the first two holes should have felt like momentum, but, by the slope of McIlroy’s shoulders and the murmurs in the gallery, instead it felt to everyone like a McIlroy omen of doom. Reed regained his advantage with a birdie on the 3rd hole while McIlroy made bogey, and now the gloom was settling in for the legions of McIlroy fans. He made two more bogeys on the first nine, while Reed recovered from a bogey at No. 7 with a birdie on No. 8 to take a four-shot lead to the second nine. McIlroy had begun the final nine with a four-stroke lead in 2011 and couldn’t hold it. How was he going to win from four behind? “I didn’t have it today,” McIlroy told the media after he posted a 74 and finished in a tie for 5th at -9 (279), eventually six shots behind Reed and tied with Henrik Stenson, Bubba Watson and Cameron Smith. Jon Rahm got to within two of the lead before hitting his approach at 15 into the water and making bogey, shooting a final round 69 and finishing alone in fourth place at -11 for the tournament and four strokes behind. But if McIlroy was falling back, there were two other young stars, Rickie Fowler and Jordan Spieth, who were lighting up the leaderboards – although the leaderboards at the Masters have no lights and are of a classic style, manually operated and impart a dramatic flair that patrons have cheered for decades. Spieth began the round all but out of sight, nine shots back of Reed, but when his scores for the first two holes were posted he was already 2-under par for the day. And the whiz-kid from Texas, still only 24, had already demonstrated a mastery of this course. In his first Masters in 2014 he had tied for second, won the next year and tied for second again in 2016. When Spieth added three more birdies on the front nine the patrons were more than counting him back into contention. There would be more to come, and everybody seemed to know it. Playing four holes ahead of Reed, but well within earshot – which is so important on the back nine at Augusta – Spieth fashioned pars on the agonizingly difficult par-4s, Nos. 10 & 11. At the par-3 12th, where in 2016 he made a quadruple-bogey that was his undoing, Spieth rolled in a 27-foot putt from off the green for birdie. He made another birdie on the 13th that was a slight disappointment after nearly making his eagle putt and two-putted for birdie again on the par-5 15th. With the massive galleries surrounding Nos. 15 & 16 who were no doubt rooting for Spieth by this point, and primed for the next thrill, it came accompanied by a shockingly loud roar as he sank a 33-footer for birdie on the dramatic 16th green to get to nine-under for the round and into a tie for the lead with Reed! With huge scoreboards all around, everybody believed that they were on the verge of witnessing history at the Masters. But, slowly the magic faded on the 17th where, like a mere mortal, Spieth made just a par, and the glow left him altogether when he struck a tree on No. 18, making bogey. His card read a brilliant 64 for the day and a final score of 13 under, 275, which would eventually leave him in third-place – amazingly, his second worst finish in five Masters Tournaments. At the same time, Rickie Fowler was making a challenge of his own to Reed’s lead, followed by raucous galleries of his own. He had begun just five shots behind, not nine like Spieth, and after an early bogey, Fowler made six birdies on his last 11 holes. The last one came with a 7-foot putt at the 18th for a round of -5, 67, lifting him one stroke ahead of Spieth and lifting the cheers of his legion of fans off the property. A few minutes earlier Reed had made bogey on the 11th but curled in a 22-foot putt for birdie at the infamous par-3 12th. On the 13th, his second shot to the par-5 came up short and looked for a moment like a potential disaster, but it hung up in the rough just above Rae’s Creek. He didn’t make birdie on the hole where nearly everybody else did, but on the more difficult No. 14, Reed hit his approach to eight feet and made the birdie putt. Again, Reed failed to birdie a par-5, the 15th which is traditionally the easiest hole on the course, and had to work his own magic to save par after knocking his approach over the green, always a perilous spot. In fact, Reed didn’t make a birdie from No. 14 to the clubhouse – an unusual result for the eventual champion. Reed left himself an eighty-foot putt on the 17th which hit the cup, but he then rolled in the resulting five-foot putt that had been the ruin of a litany of legendary players before him. He made the putt that saved his par and kept him one stroke ahead of Fowler with one very difficult hole to play. Reed didn’t make it easy on himself when he blasted his approach from the fairway to 25 feet above the cup, and above the infamously steep slope that crosses the 18th green between his ball and the hole. The slope on the already front-tilted green makes that putt a candidate to roll right by the target and off the green. But Reed calmly rolled his approach putt to four feet and, like he later told the media he had pretended half-a million times as a kid, rolled in the putt that made him a Masters Champion. Many people will tell you that saying Reed calmly stroked home a winning putt is an oxymoron because those who know him well believe Reed has no fear – except, perhaps, a fear that his golf game might go un-respected. If that has ever happened in the past, Reed’s performance in the 2016 Ryder Cup, where he carved out a never before matched record of 5 – 0 including a singles win over McIlroy, and now sinking a putt to win the 2018 Masters – it probably won’t ever happen again. Another Masters had been fought to a blazing finish, and on a beautiful spring day in Georgia, the final round scoring average was 70.49, believed to be the lowest single round in the history of the Masters. 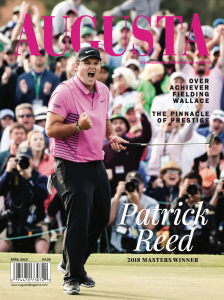 Article appears in the April 2019 issue of Augusta Magazine.